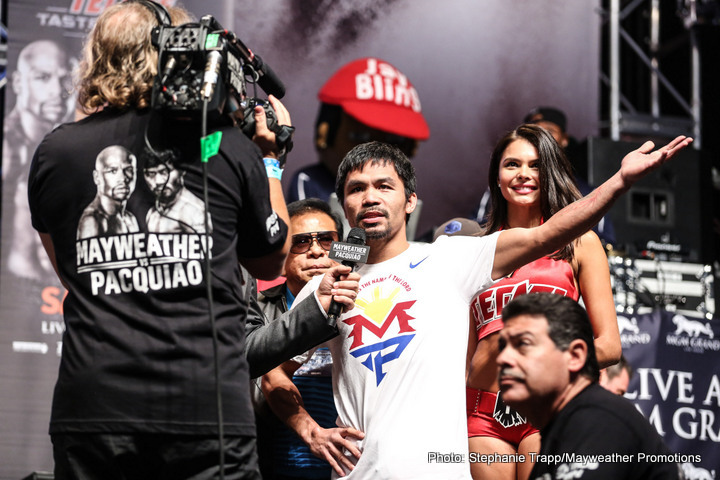 Will Pacquiao’s saltwater healing enable him to beat Khan? By Chris Williams: Manny Pacquiao’s promoter Bob Arum says he’ll be meeting with Amir Khan (31-3, 19 KOs) in the UK to discuss a fight between him and Pacquiao (57-6-2, 38 KOs) in 2016. The fight would likely be Pacquiao’s first after coming off a defeat to superstar Floyd Mayweather Jr. and a bad shoulder injury in that loss. Pacquiao says he used salt water to heal his shoulder without rehab following surgery to repair his torn right rotator cuff last May, but we don’t know if Pacquiao’s miracle cure will hold up in a real fight or, if it will enable him to even make it through a training camp to get to the fight. What we don’t want to see/hear is Pacqiuao blaming a loss to Khan on his shoulder not being 100%. “No problem, I’m fine. It’s god’s work. I never saw a doctor. I never did rehab. All I did was swim in the ocean as often as I could. The salt water healed my wound,” Pacquiao said via Philstar.com. Not undergoing a traditional rehab for his surgically repaired right shoulder has me wondering how well Pacquiao’s shoulder will hold up once he gets into training camp. Arum might be able to put the Pacquiao vs. Khan fight together, but if Pacquiao’s shoulder is going to break down on him due to him forgoing traditional rehab for his shoulder, then I think Khan might wind up with no fight. It would be a terrible event for Khan, because he’s been waiting his entire career for a big money mega-fight against Mayweather or Pacquiao. Just when he gets a fight against Pacquiao, he winds up with nothing when/if Pacquiao’s shoulder falls apart during training camp. Even if Khan does fight Pacquiao and beats him, he might have to hear the same injury excuse that Mayweather had to hear after the fight with Pacquiao mentioning it and creating doubt in the minds of a lot of boxing fans whether Mayweather or Khan would have been able to beat the Filipino star if he’d been 100% healthy for the fight. We already heard the shoulder excuse after Pacquiao’s loss to Mayweather, and it would be sad to see Pacquiao bringing up the injury again if things don’t turn out well for him against the 28-year-old Khan. “I have to talk to these people first (to determine if a fight can be made),” Arum said via mb.com.ph. Arum will likely be able to put together the Pacquiao-Khan fight, because Khan badly wants the bout now that he’s come up empty in his pursuit of Mayweather for a nice payday. I’m not sure what kind of money that Khan is hoping to get out of a Pacquiao fight though. I guess it would need to be more than $5 million, because Khan could make that kind of money in a fight against Kell Brook. If Arum and Pacquiao aren’t going to give Khan a decent purse split for the fight, then I don’t see Khan agreeing to it. I don’t think a split of 76-24 is going to work for Khan. I think he’s going to be looking for at least a 60-40 split of the loot. Would Pacquiao and Arum give Khan a split like that? No, I don’t think they would, not for a second. For Khan to get a fight against Pacquiao, he’ll likely need to agree to either a 75-25 or 70-30 split. They’ll obviously point out that Khan has never fought in a pay-per-view fight as the headliner in the United States as a reason for him having to agree to the smaller purse split. Unless the money is really good, Khan might be better off walking away from the negotiations if he’s not going to get a better payday than he would against Kell Brook. The whole idea behind Khan fighting Pacquiao should be for him to get a big career-high payday, and a payday that would be unrivaled for any of his other potential fights on the horizon. If Pacquiao is going to hog the loot for the fight with him taking a huge purse split, then it hardly makes it worthwhile for Khan to take the fight. He would be better off moving on and fighting Brook, Keith Thurman, Shawn Porter, Adrien Broner, Lucas Matthysse or Danny Garcia. Those are all fights that would make Khan a lot of money because he’d have them put on pay-per-view in the UK, and he could like the lion’s share of the loot. A Pacquiao fight should mean that Khan is getting somewhere along the lines of $10 million, possibly a little more than that. If he’s not going to get that kind of money, then it’s not worth it for him to take the fight. You can’t have Khan fighting Pacquiao and making $5 million or less for the fight. I’m not sure how much Chris Algieri got for his fight against Pacquiao, but I don’t imagine that it was more than $5 million. I doubt it was even half of that. There is a positive side for Khan if he takes the Pacquiao fight. If he beats him, then there will almost definitely be a rematch between them unless Khan really beats him badly. A rematch for Khan would give him a better purse split of the loot and there would likely be a lot more pay-per-view buys than their first fight, as many boxing fans will want to see if Khan will put Pacquiao out of his misery and send him into a permanent retirement. Fans would gladly purchase the Pacquiao-Khan 2 rematch just to see if Khan will finish off Pacquiao. You would have to think that Pacquiao would retire after a second loss to Khan because it would be difficult to ask boxing fans to continue to purchase his fights on PPV with Pacquiao having lost his last three fights. Pacquiao’s record in his last 7 fights would be 3-4. That’s 3 wins and 4 losses. That’s not good. Even the casual boxing fans might back off from purchasing Pacquiao’s fights if he gets to that point. Boxing » Amir Khan » Will Pacquiao’s saltwater healing enable him to beat Khan?